Fileless attacks surged in 2017, largely due to their ability to bypass traditional antivirus solutions. Last year was host to several fileless malware victories. OceanLotus Group infiltrated Asian corporations during Operation Cobalt Kitty, and conducted nearly six months of fileless operations before detection. Ransomware hall-of-famers Petya and WannaCry both implemented fileless techniques in their kill chains. Every major player in information security agrees that fileless attacks are difficult to stop, and the threats are growing worse. Abandoning files is a logical and tactical response to traditional AV solutions which have overcommitted to file-intensive and signature-based blacklists. What can security solutions offer when there are no infected files to detect? How will a blacklist stop an aggressor that only uses legitimate system resources? The security landscape is changing and the divide between traditional AV products and next-generation security solutions is growing wider by the day. 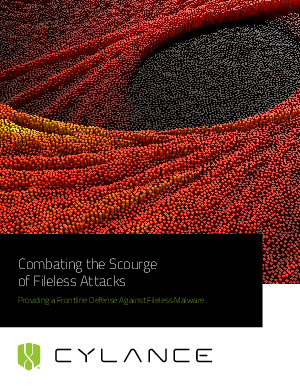 Cylance® has built a reputation on security driven by artificial intelligence and provides a frontline defense against fileless malware. This document details how Cylance protects organizations.